Have you ever tried streaming something on Netflix only to have your episode of “The Office” interrupted by a buffering screen? What about that YouTube viral video everyone’s talking about that just won’t finish loading? Maybe you’ve just been trying to download a video of your granddaughter’s first communion and it’s taking forever. Slow internet can be a real drag in a world where the internet is everywhere and integral to so much in our lives. So, what do you do when your attempts to have movie night with Netflix or Hulu are thwarted by slow internet speeds? Or when you’re left out in the cold at the office water cooler because your internet isn’t fast enough for you to see the latest viral YouTube video? 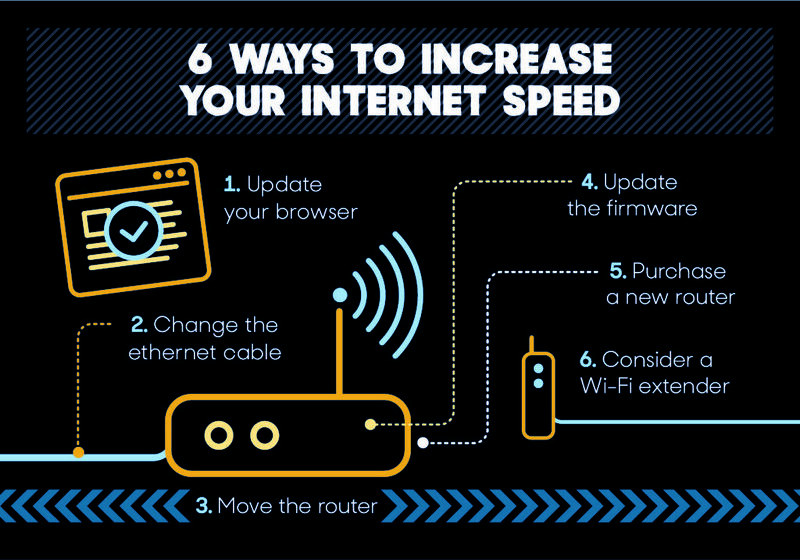 You need to increase your internet speed. But how? 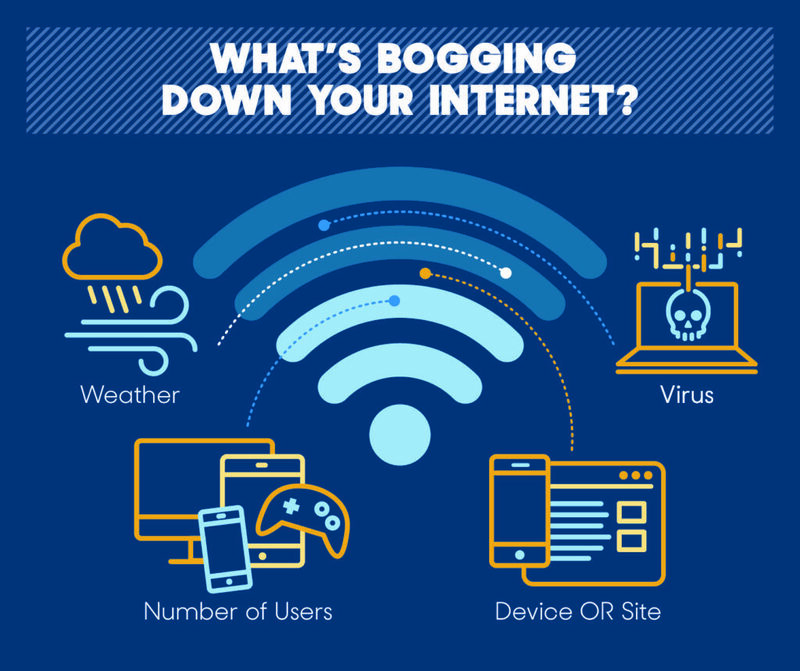 What’s Bogging Down Your Internet? The first thing you should do is diagnose the problem. As vast as the internet is, there are lots of little things you can test without having to contact an expert. That way, at the very least, you can rule out some of the more general factors that could be slowing down your internet. This will make your call to your internet service provider (ISP) less frustrating if/when the time comes to get an expert’s opinion. There’s some debate on whether the actual weather—rain and high winds—can impact internet speeds or if it’s simply the results of inclement weather (hail and ice damaging power and phone lines). Techwalla claims water droplets can absorb the radio frequency associated with Wi-Fi signal, thus partially blocking the signal. Of course, since most home Wi-Fi is deployed in the home, it seems strange that rain would hurt a typical person’s internet performance. As ubiquitous as YouTube is, there once was a time, however brief, when no one in the world could access it. Yes, even go-to sites and social media platforms can have bad days. So, if you’re experiencing slow load times on your Facebook account but everything else seems OK, it might not be your internet speed. The best way to rule this out is to try accessing other sites. If you’re finding that load speeds are considerably faster on image-heavy sites like Imgur when compared to the text-heavy Reddit, then you know it’s probably not your connection that’s the problem. You might just have a slow phone. If you’re browsing the internet on your smartphone and it’s taking a while to load certain pages, it might be the device. In the event it’s your phone that’s at fault, we recommend looking for any firmware updates you might have missed. Also, if possible, see if you can try accessing the same pages using another device like a tablet or a laptop. If you don’t have any problems on other devices, then it could be a device issue that’s causing the slow speeds. Sometimes you’re not the only one on the network, and whether it’s your roommate downloading a massive file or multiple family members all trying to stream Amazon Prime Video, this can impact your internet speeds. Theoretically, most individual wireless routers can support up to 250 connected devices, according to Lifewire, but it’s certainly not ideal. These devices would all share the same network connection and it wouldn’t take long to max out the network speeds with multiple users all engaged in various forms of streaming, downloading, uploading, or just browsing. If you’re experiencing slow speeds on a desktop PC or a laptop, you should consider the possibility of a computer virus. These malicious programs can live rent-free on your machines, sucking up resources and performing tasks in the background that can slow down your computer. We recommend scanning your computer daily and there’s a plethora of free, reputable anti-virus programs to consider. Now that we’ve looked at some of the more common causes (and potential fixes) for slow downloads and streaming, let’s talk about how to increase your internet speed. There are quite a few things you can do that can help kick your network into a higher gear. We’ll start with the less intensive tips and work our way up. Believe it or not, part of the problem could be with your internet browser. We’re mostly speaking to the desktop/laptop crowd but it’s still something to consider. Take, for example, what Mozilla engineer Chris Peterson had to say in a Twitter thread a few months back regarding YouTube and the Firefox internet browser. The engineering program manager at Mozilla helped shed some light on why YouTube’s page load rate was 5 times slower on Firefox than on Chrome. Turns out YouTube’s redesign had been optimized in such a way that only the Chrome browser was displaying the site properly. Sometimes, if the pages aren’t loading or your download is taking too long, it could be worth trying a different browser. In the case of Peterson, he was able to point Firefox users toward an extension that would address this discrepancy. We also recommend keeping your browser up to date with the latest patches and fixes. Most browsers do a pretty good job of auto-updating or raising the alarm when you’re caught using last year’s model. Ethernet cables are those cords that almost look like phone cables, but are slightly wider at the plug-in component. They plug into the back of the modem and the wireless router and different types work better or facilitate different speeds. Sometimes the problem with slow internet speeds could be with the cable, especially if you’re using an older type. Try replacing the existing ethernet cable with a newer version. These can be purchased at most retailers that specialize in consumer electronics. Sometimes it’s literally as simple as moving the router. If you think about Wi-Fi signals as radio signals, then it makes sense. The farther you get away from the router (and the more walls and floors between your device and the router), the weaker the signal. The weaker the signal, the slower your internet speed. All routers come with firmware that, on occasion, will need to be updated. This is done manually and most routers come with detailed instructions on how to determine your router’s information and finding the necessary updates. However, if you are having trouble with this or don’t know where to begin, we found this detailed wikiHow guide to be extremely helpful. By updating the router’s firmware, you can improve the connectivity and, perhaps more importantly, keep your wireless network secure from unwanted visitors. Routers can become obsolete long before the physical parts begin to fail. As wireless networking standards continue to improve, devices that were better suited for older standards start to show their age. In situations such as these, there might be nothing for it but to purchase a new router. In our review of the best wireless routers, we considered 136 models before arriving at our top picks. We recommend reviewing our findings and considering your home’s layout (as well as the number of people on the network) in order to find the most optimal router for your needs. We already mentioned how helpful simply moving your router can be. However, if this is inconvenient or not feasible and you’re still left with Wi-Fi dead zones, the next best step could be to look into a Wi-Fi extender. Just like it sounds, these handy devices can be plugged into power outlets and catch Wi-Fi signal, and then release it with minimal interference. In our review, we covered two of the best models on the market with our focus primarily on reliability. If moving the wireless router just isn’t an option, try extending the signal, instead. Does the U.S. have the fastest internet in the world? Not the fastest, but also not the slowest! In fact, out of 200 countries ranked, according to a study by internet comparison site Cable and reported on by travel blog Atlas & Boots, the U.S. came in 20th with an average speed of 25.86 megabits per second (Mbps). That might not sound like a lot since online activity—downloading music, uploading videos, etc.—is usually measured in Megabytes so let’s look at an example. We’ll convert 25.86 Mbps it into megabytes per second (MBps) by dividing by 8, which equals 3.23 MBps. This means that if you were to download a 600 Megabyte (MB) file with an internet speed of 3.23 MBps, it would take over 180 seconds or 3 minutes. For some people, that’s no so bad but if you’re working in a fast-paced environment (journalism, advertising, design), you’re likely dealing in Gigabytes which can take even longer at those rates. The best way to do this would be to review your bill when it comes in the mail or, if you’ve gone paperless, access your account online. Most internet providers give you this option, especially those that are enabled for online bill pay. Is the internet service provider (ISP) to blame? If you do find yourself needing to call the ISP, they will likely ask you a series of questions and provide you with some actions you can take to try and improve the problem. They might refer to this process as troubleshooting. The ISP will test the signal coming into your home and compare that with the plan (and the speed) you’re enrolled in. If the signal is strong in your home based on the ISP’s signal test, then the fault lies in your home possibly with the equipment. If, after all this, your internet is still too slow or doesn’t feel fast enough, it might be time to look at either upgrading your package or switching to another service provider. We’ve reviewed the best internet service providers as well and that list might be a great place to start shopping for another plan if all else fails. Just remember there are a lot of factors that contribute to a slow internet speed and it might take some research and investigation to find out exactly where the problem lies.